Based on a true story, 12 Years A Slave is a deeply moving exploration of the brutality of slavery in the American South, prior to the Civil War. Chiwetel Ejiofor delivers a masterful performance as Solomon Northup, a free man kidnapped into a nightmare of evil. It's 1841, and Solomon is an educated free black man living in Saratoga, New York with his wife and two children. A talented fiddler, Solomon is a respected member of society. When the rest of his family is away for a short trip, Solomon is lured to Washington DC by the promise of some extra money for performing in a travelling circus. Instead, after a night of too much celebratory drinking he wakes up in shackles, having been sold to slavers. Illicitly transferred down river to the South, Solomon is handed to slave agent Theophilus Freeman (Paul Giamatti), and eventually sold to land owner William Ford (Benedict Cumberbatch). 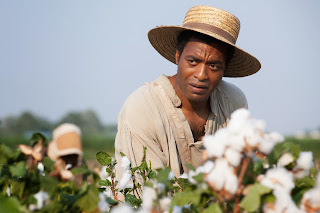 While Ford is a relatively reasonable master, Solomon runs afoul of his foremen and is re-sold to Edwin Epps (Michael Fassbender), a cotton plantation owner. Epps is slightly insane and whip-happy, and infatuated with Patsey (Lupita Nyong'o) his most productive slave, triggering the fury of his wife Mary (Sarah Paulson). As Solomon does what he needs to in order to survive as a slave, he never stops trying to regain his freedom, despite the brutality of life under Epps. A chance encounter with Canadian labourer Samuel Bass (Brad Pitt) offers an opportunity to once again change the course of his life. 12 Years A Slave captures the history of all slavery through the story of one man. Solomon is an individual whose relatively small story of survival summarizes the awful arc of the mammoth slave trade in America. While Solomon endured 12 years in captivity and forced labour, his race suffered more than 150 years of abuse, and Solomon's story brings the horror down to the most painful scale of one man being deprived of his freedom and all his dignity for no other reason than the colour of his skin. Director Steve McQueen weaves an epic tale of an honourable family man subjected to the worst atrocities that humans can conjure. McQueen never loses the man at the heart of the tragedy, and avoids the trap of abandoning Solomon as a pure victim at the mercy of events that he cannot control. Throughout 12 Years A Slave, Solomon remains the protagonist who must continuously calibrate his behaviour to maintain any hope of one day regaining his freedom. The strength of the movie comes from Solomon's adaptation to new, abhorrent surroundings, and navigating his way through an unwanted but potentially crushing reality. The film contains some extraordinarily disturbing, almost unwatchable scenes, McQueen taking an unblinking look at human cruelty that is too easy to dismiss within the simplification of the word "slave". Solomon endures a hanging while Patsey experiences a severe whipping, and in both scenes McQueen parks the camera and keeps it running, then edits the abuse into long takes that magnify the injustice into a long, twisted shadow across the face of history. The two central performances are both outstanding, particularly in drawing the contrasts between the humane and the vile. 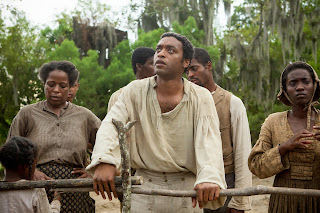 Chiwetel Ejiofor delivers an immense performance packed with controlled courage, determination and vulnerability. With subtle understatement, Ejiofor conveys barely concealed fear, quiet rage, and a never ending search for a justice-based end to an all-too-real nightmare. Michael Fassbender turns Edwin Epps into a villain repulsive in his languorous normalcy. Fassbender draws power from an economy of emotions and actions, turning Epps into a more hateful character by his aggravating self-conviction in the security of his position and his sheer lack of concern for anything except lusting after Patsey, his slaves physically victimized while his wife is wrecked with emotional hostility. 12 Years A Slave is a grand achievement on a human scale, a story for the ages delivered with raw passion and a heart filled with plenty of pain and eternal hope.